Daniel Junge’s Sundance documentary Being Evel (2015) unveils the remarkable rags-to-riches story of Robert Craig “Evel” Knievel. Through grainy library footage, interviews with his nearest and intermittently dearest, and replays of TV appearances from his glory days, Junge paints a refreshingly candid picture of a man to hold the Guinness World Record for the number of bones broken in a lifetime (433), who had nearly as many female companions and who single-handedly invented extreme sports by repeatedly defying death on a motorcycle. An inspiration to countless stuntmen and adrenaline seekers since, Knievel was as tyrannical as he was fearless and the film does not pull any punches in laying bare a conman, bully, womaniser and self-deluding maniac who came to believe his own hype. Co-producer and talking head Johnny Knoxville cites Knievel as a principal influence of the Jackass crew, describing the daredevil’s life as “fast, faster and disaster” and Being Evel charts the meteoric rise of a rural hellraiser to global superstar. Humble beginnings, and a troubled childhood, in the tough mining town of Butte, Montana, would be left behind for Moses Lake, WA, and then Hollywood. A self-imposed aura of invincibility from a hardened existence saw Knievel attempt his then most audacious jump at Caesar’s Palace, Las Vegas, on New Year’s Eve 1967. Even in an era long before YouTube, the horrific images of a devastating crash quickly made the rounds and a star was born. With a bar that had to be raised a notch higher for every success or failure, the stakes and life- threatening undertakings, along with a cocktail of drink and medication, began to take their toll – leading to severe paranoia in the wake of an altercation with Hells Angels at San Francisco’s Cow Palace in 1972. The materialism of fame, fortune and the trappings of wealth moved with Evel in one direction but his family and those closest to him went the other – even interviewed long after his death in 2007, the effect of her former husband’s antics and philandering are etched all over his ex-wife’s face. His children do idolise him to a certain extent but a degree of shame tinges all of their words. 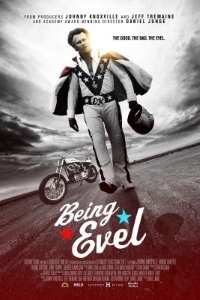 Being Evel does not quite have the break-neck speed of its subject, but it’s nonetheless well paced and engaging throughout. Its principle success is in its even-handedness. Such frank testimonial may not have been possible prior to 2007. Knievel was infamously charged with assault after attacking his former press agent, Shelly Saltman, who had written a displeasing account of the failed 1974 Snake River Canyon jump. Speaking to the press moments before this most dangerous of stunts – which could have led to his death – Evel said, “I think that a man was put here on earth to live, not just to exist.” Despite his faults, his was a life lived to the fullest and that is to be admired. The London Film Festival takes place from 7-18 October. For more coverage, follow this link.